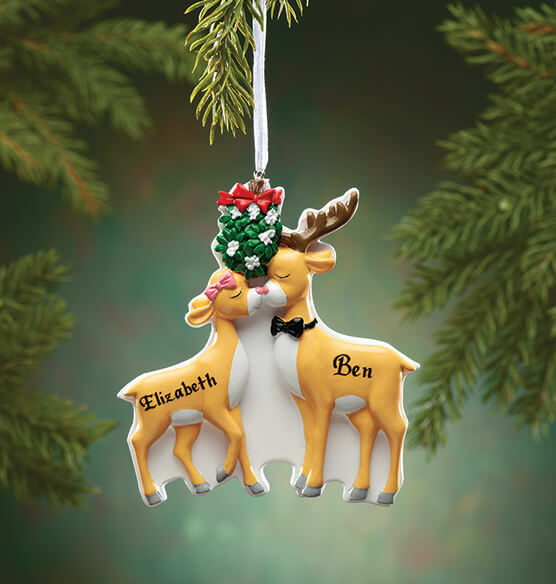 Because loving “deerly” is cause for celebration, this personalized Kissing Reindeer Couple ornament will be customized for one special couple (and so many reasons!). Whether first Christmas, wedding, anniversary or “just because” gift, our personalized Christmas ornament adds to the fun—lovingly detailed and only found here. Specify 2 names; limit 1 line, 8 letters/spaces. Resin. 4" long x 6 1/3" wide.